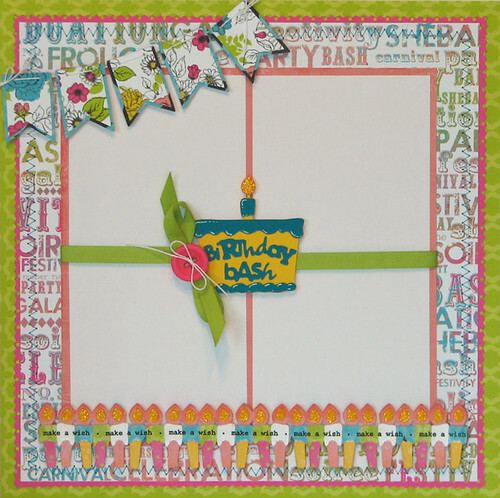 I have these two layouts that I created for the Birthday Layout Challenge that Jinger and Cricut had on facebook for the 5 year anniversary of the Cricut and the introduction of the new E2 machine. I am one of the very first to own the Cricut machine. I bought mine the first time it was sold on QVC and I ended up on the second shipment. Since then, the Cricut has change the way I craft. I ♥ my Cricut!! 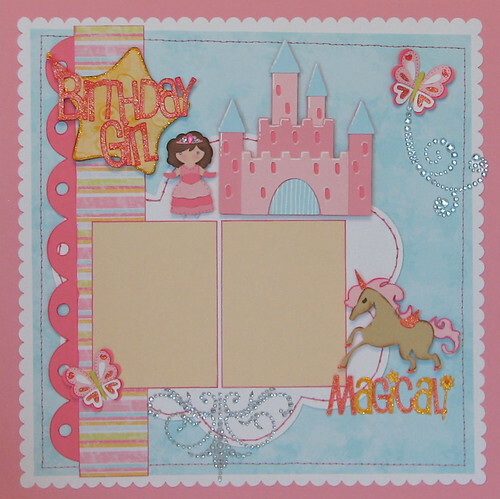 This first layout is done with Once Upon A Princess (princess, castle, unicorn, butterflies, titles and subtitle) along with Create A Critter (cloud) and Accent Essentials (scalloped strip). I hand stitched along the border of the cloud and machine stitched around the edges of the layout. I added some Stickles to some of the cuts. The cardstock is Stampin' Up! and the patterned paper is CTMH. This is my second layout. I used Birthday Bash for all of the cuts. I machine stitched around the layout and I added Stickles to the candles. The candle border is welded together with my Gypsy and I added some SRM Stickers to it. The cardstock is Stampin' Up! and the patterned paper is from Pink Paislee. These layouts do not have photographs because that was a requirement for the challenge. ADORABLE layouts! I especially love the second! You are so talented! Thanks for sharing! Your LO's are awesome. So sorry that they didn't get the attention that they deserved. I'm glad you got pics of them, so that you could share all of your hard work and talent with us. Your layouts are wonderful, I don't know how you sent them away - lol!